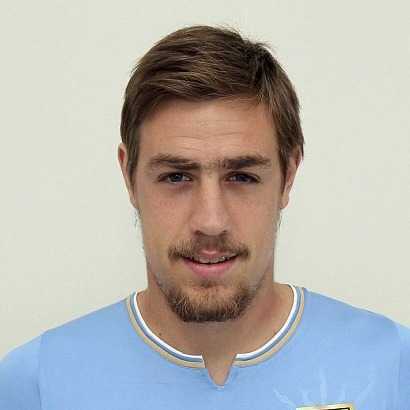 Sebastian Coates one of the well known Uruguayan professional football player who plays for Premeira Liga Sporting Club and the Uruguay national team as a centre back. Currently, he is playing in Sporting club. His shirt number is 4. Uruguayan fans call him Little Lugano. On 7th October 1990, Sebastian Coates was born in Montevideo, city of Uruguay. He was raised in there. His full name is Sebastian Coates Nion. He belongs to Uruguayan nationality. His birth sign is Libra. Sebastian Coates was born to Peter Coates. From the childhood, he had very keep interest in the football. At the age of seven, he started playing football. Now, he is one of the famous football player. At the age of 11, Sebastian Coates started his career at club Nacional de football institution of Uruguay. There, he spent 8 years and he was a regular player from his debut in 2009. In Nacional, he played for two seasons and scored eight goals in sixty appearances before joining to English club, Liverpool. In August, 2011 he agreed on a long term contract with Liverpool. The fee was undisclosed and was around $9 million dollars. On 18th September, he made his debut for this club, Liverpool against the match with Tottenham Hotspur replacing injured Daniel Agger in the minute of 27 with 4-0 defeat. He again scored his first goal for Liverpool against with the Queens Park Rangers on 21st march, 2012. Later he was loaned to the club, Sunderland for 2014-2015 seasons. There, he made his debut against Stoke city at the stadium of Light. Then, he was on a permanent four year deal with Sunderland with undisclosed fee of around £2 million. Later, he joined to Sporting CP on a loan until the end of the season. On 2nd February 2017, he signed a contract with sporting on a permanent deal. Sebastian Coates made his international debut at the 2011 Copa America. He was part of Uruguayan at the 2012 Olympics, 2014 FIFA World Cup and 2015 Copa America. He made his international debut against Chile on the 2011 Copa America. He also won the award for the best player at the end of the tournament. He name was also enlisted in Uruguay's 26-man squad for 2018 World Cup in Russia. In 2013, he was married to his wife. They had also a son named Santiago, was born on October 2014. He has not made public about his wife details. His hair color is Hot Tofee. He is also quite close to her mother and he also has close friend, Mauricio Pereyra. He is also an Uruguayan Player. He has height of 1.95 m. The highest recorded fee of Coates is $8.25 Million.